When people come across great posts on websites and blogs, they want to share their finds with their friends or social network followers. Those people may then visit your site, which increases your traffic and page views. Links to your site can also be shared in other web posts and backlinks are like gold when it comes to rising to the top of search results at Google, Bing and Yahoo!. Each link back to your site moves you that bit closer to page one of search. 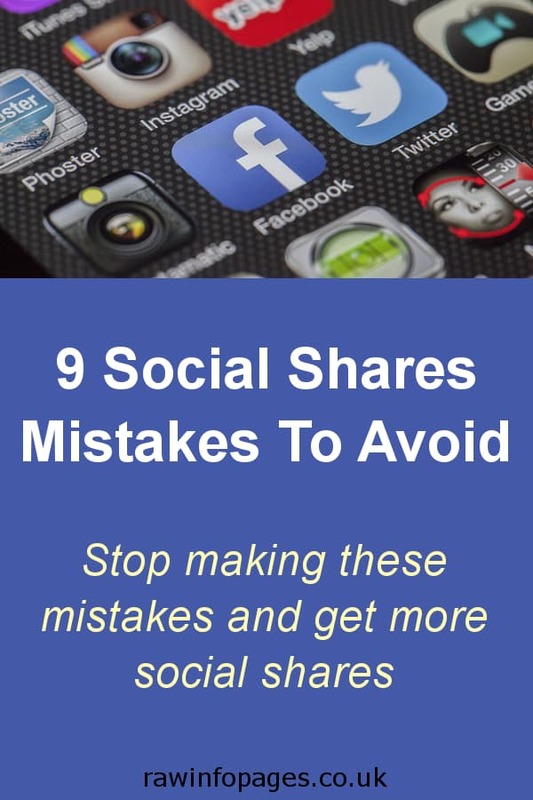 If the posts on your blog or website are not getting many shares, it could be because you are making some rookie mistakes. Correct them and your shares could skyrocket, quickly followed by your visitor numbers and page views. Here are the most common mistakes people make. Making it super easy to share a link to a web page encourages sharing. No-one wants to spend time and effort jumping through hoops just to share something they find on the web. People want to click, share and then get on with reading the article or browsing the web. Social sharing buttons on web pages are great for encouraging your website visitors to share links to posts. A Pinterest pin button, Facebook button, Twitter tweet button and so on, all make sharing links easy. A click brings up a form and people can type a comment and post it in seconds. It is not just about making it easy, sharing buttons are visual cues that remind people to share your posts. They may forget if there are no buttons, but seeing a blue Facebook button or red Pinterest button on the page reminds them to share. There are many WordPress plugins to automatically add social sharing buttons to your posts. You just install them, enable them and then configure a few settings, usually related to which buttons you want to show and where to show them – top, bottom, left or right on the page. Everybody loves a great photo and people love sharing their finds with others. A post with no photos or poor photos discourages sharing and should be avoided. There is rarely a good reason not to have an image of some sort. Make it a great one and people will want to share a link to the image or the post. The image must be high quality and related to the subject of the article, so don’t include anything blurry, off topic, badly lit, over exposed and so on. Good quality images get more shares, so make them as good as you can. Original photos are the best kind and you should try to shoot your own. Professional photography gear helps of course, but a good quality phone can take impressive photos too. Get the lighting right, steady the phone, use the pro features in the phone to set the ISO, exposure, and shutter speed, and you can take a great photo. 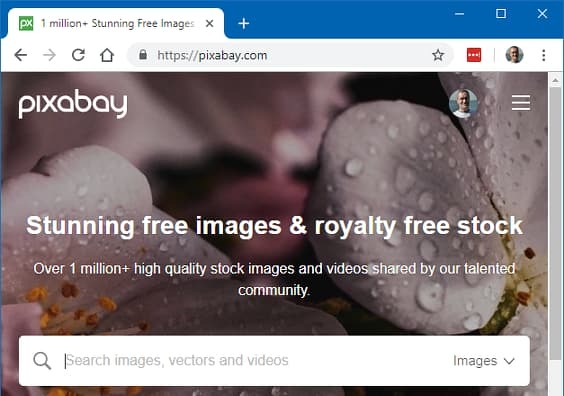 Only if you have tried and failed should you resort to free photo libraries. Some images are used a lot and if you use one that the reader has seen 10 times before on other sites, they won’t want to share it. Pinterest is the main source of traffic for some websites and blogs, and it could be yours with the right strategy and content. If there is no image to pin, readers might not think of sharing the post on Pinterest, but if there is a great image right in front of them, it encourages them to share it with their followers. 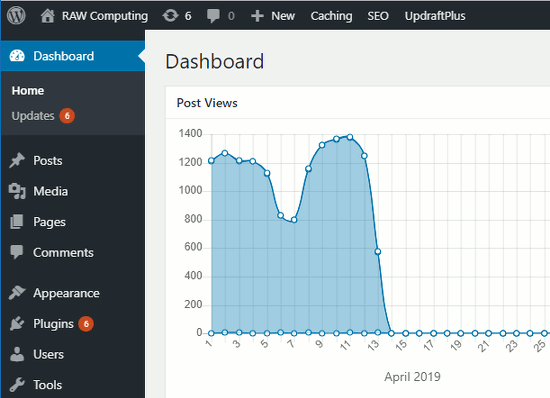 There are people getting more than a million views a month on their Pinterest account and if one shares a pinnable image from your site, you could get a lot of traffic from it. 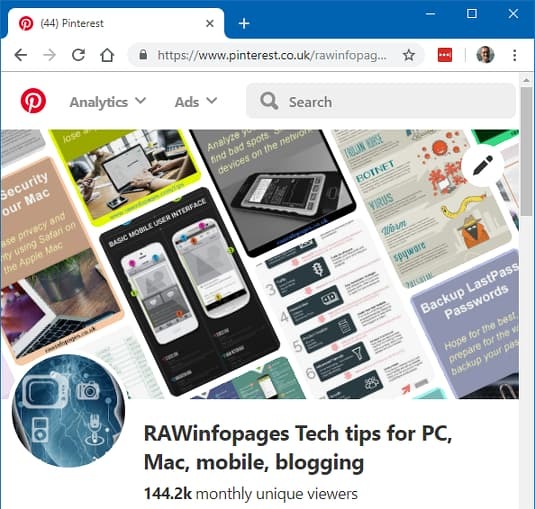 You can tell blogs that rely on Pinterest for traffic because they have a large pinnable image within the text, usually somewhere near the start of the post. It is huge and at a minimum it should be 600 x 900 pixels and Pinterest recommends even bigger pins. Make sure you have a pinnable image. Inserting Pinterest pins in posts is not for everyone and there are disadvantages. For example, it can be a source of irritation for readers that so much screen space is taken up by a Pinterest pin. After all, it is only there for pinning purposes and it adds little to the article itself. Pinterest is very good for many topics, but not for everything. You will not find large pin images in stories on the New York Times website because news stories are not shared on Pinterest. Your blog has to be in the right niche for the mainly female Pinterest audience. If you do not share your website and posts yourself, how will people know it exists? You have to share to get shares. For example, if you share a pin on Pinterest and tweet on Twitter, someone might see them and re-pin your pin or retweet your tweet. Share links to your site and posts wherever you can, but don’t overdo it and spam. Instead of sharing 10 times on one service, share once to 10 different services. You may then get re-shares. If you blog about what you did at the weekend, what you ate for breakfast and how you woke up with a headache this morning, no-one will share your post. It simply isn’t information you want to share. If you blog about how to remove red wine stains from a white shirt, then people want to share that information with their friends and followers because it is useful to know. There are no rigid boundaries, but if you write about yourself, it may not be shareable. What you say has to be useful or entertaining to others. ‘Top 10 cat memes’ is more shareable than ‘Top 10 things that irritate me’. Be careful when writing about yourself. 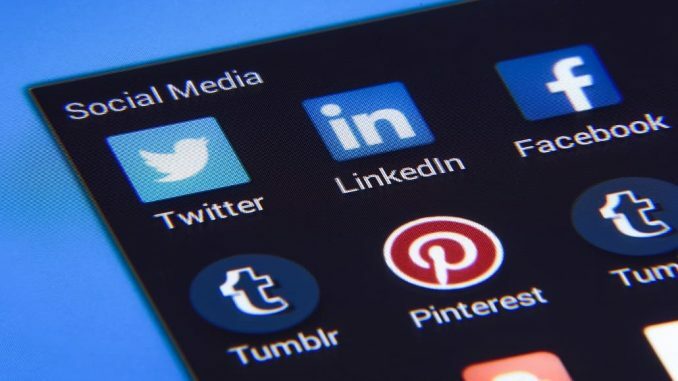 Do you ask people to share your posts? People may share a link to a post on your site because it is interesting or useful, but even more people will share something if you actually ask them. A message could be placed anywhere, but a good place is the caption for a photo, like ‘Share this on Pinterest’. It would be even better if there is a Pinterest share button nearby or your WordPress social plugin adds a Pin It button to the image. 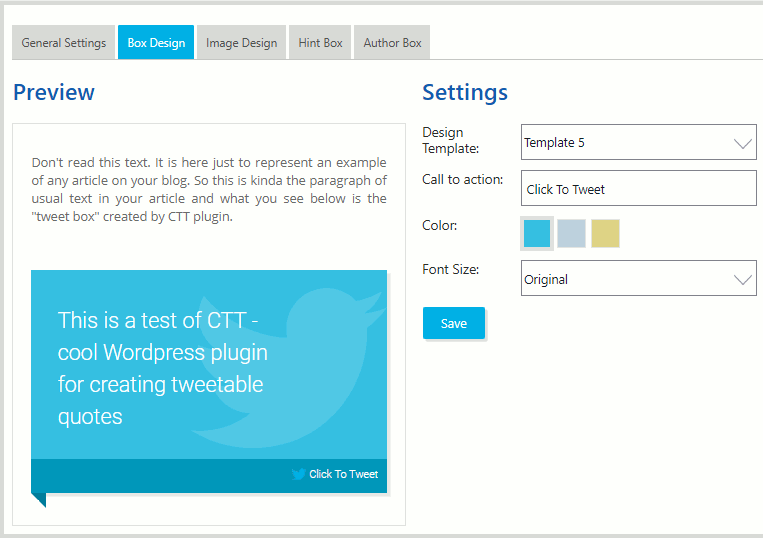 There are WordPress plugins that enable you to create ‘Click to Tweet’ text widgets in your posts that enable people to tweet a ready-made comment on Twitter. Anything that makes it easier for people will generally help. You can also create your own Click to Tweet widgets. See How to insert Twitter buttons and click-to-tweet links in web articles. The length of a post is a factor when it comes to sharing and very short posts are not shareable. Short and simple posts don’t need to be shared and people can simply tell their friends what they found. Write more in-depth articles to get more shares and avoid short and simple posts. Some websites are very irritating and this puts people off sharing them. After all, people don’t want to force irritations on their friends or followers. What are web page irritations? You might land on a page that shows a pop-up cookie notice, then another pop-up notice about GDPR, then there is a pop-up request to sign up to an email, then a video advert starts playing, and so on. Believe or not, some websites are like that and you have to spend 30 seconds clearing the page of pop-ups and videos before you can even see the content. And then you want people to share it? No way! You cannot remove all irritations because some items are compulsory, like cookie and GDPR notices, but don’t make it any worse than it has to be. Only a certain percentage of visitors to your site will share stuff and it is a very small number. If only 1% share a post that gets 100 views then that is only one share. If a post gets 1,000 views then 1% is 10 shares. The more people you can get to visit your site, the more shares you are likely to get. It can snowball and gain momentum, so more shares mean more visitors which means more shares, and so on.